While I'm almost a month late, I wanted share with you some of my favourite products and memories of 2017. I only picked this up at the end of last year as you might have seen in my "ON TRIAL SKINCARE" post. From that, it's quite apparent that I really liked this day cream. The texture, the smell, the absolutely fabulous hydration it gives my ever so dry skin is exactly what I need. Cruelty-free and super affordable made this an everyday staple in 2017. Super drug have been really killing it this year for me. Their face mist is another one of my favourites. While it's not a setting spray, it still gives my face a nice refresh and helps my make up look a little more dewey than it does without. Such an affordable addition to my make up routine. Another one I picked up in the second half of the year. After getting a new job (that I last 3 days at) I thought I'd celebrate with a foundation I was eyeing up for a while. You can read all about my experience here in my more in depth review. Since writing this, my opinions on this foundation aren't as positive as I first said after having some more time to get used to it. However, this foundation has still been my full coverage choice whenever I need one. Throwing it back to the start of the year now when I decided to pick up this Anastasia dupe. This, along with the pomade, has made doing my eyebrows all the more easy. Having such a great colour selection, it wasn't hard to find the perfect ashy brown I needed all for only £4. I'm already on my 3rd one of these and it's worth it every time. This has been the hydrating life saver of the year. I've come to apply this every night to combat my dry skin. It lets me wake up to better skin than I went to bed with. Now, with The Body Shop 100% cruelty-free, I more than happy to be sharing this product with you. I urge anyone with dry skin to give this a go! Something I use almost every night and I'm still no where near finishing it. If only I'd discovered this sooner in the year...Since finding out Collection is not a cruelty-free brand I've been on the hunt for a replacement concealer. It's been hard to find one pale enough for me but this one is perfect! While slightly more pricey than my usual concealer, I think it's worth paying that little bit extra for something of better quality and cruelty-free. This has to have been the worst year for reading for me. If I wasn't reading Psychology related books that bored me to death, I was trying my best to read all the Harry Potters before I make it to 20 (sidenote: I haven't done it). Out of the minimal number of books I've managed to read this year, I have to give an honourable mention to Freshers by Tom Ellen. I am probably slightly biased with it being set at my university but it was one of the only books in a while that has made me laugh out loud and want to read the book within a day. It's definitely one for uni goers but even if you're not, I'm sure you could still relate to the funny nature of this teen book. So I can usually tell whether a year has been a sucky one or not (even though the trend usually follows the former). 2017, however, is hard to categorise. 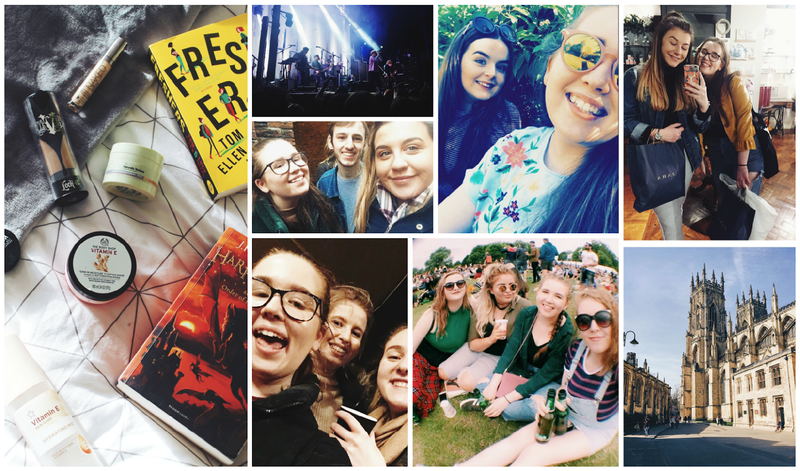 With university taking up most of my time, my year has revolved around just that. So, I'd describe 2017 as average. With the stress of exams right at the start of the year laced with a few hysterical moments, I think my 2017 is best summed up as average. Nevertheless, there are some standout memories that I thought I would share. With Lewis Watson back at the start of this year followed by Community Festival in Summer and then VANT and Nothing But Thieves to end the year, it's not been a mad one for music but the concerts I've witnessed were ones to remember. My first experience of a festival is one that has definitely set off a want to go to more festivals in the future. I forget how much I love the gig atmosphere so fingers cross to more gigs to come in 2018. As I say, my life has basically come uni work and, if not, actual work at my part time job. Even with this stress, it's given me some great opportunities to live with and be surrounded by some of my favourite people. It's very rare that I don't go a day without laughing; whether it's from hearing a daft joke, internet meme or just losing the plot as we all become bogged down with deadlines. University life is definitely entertaining. If it's not being surrounded by friends at university, having my friends from home come to visit has given me some great memories. It allows me to be a tourist in my own city as well seeing my old friends interact with my uni friends is just great. Having Kirsty come up for a weekend gave me the breather I needed from my never ending deadlines. Also, starting the year off with Jacob and Jade visiting me for my birthday and then again at the end of the year before we drove home for Christmas. This reminded me how lucky I am to have those two to act like three old women together. So there's a little run down of the things I loved and enjoyed in 2017. Let's hope 2018 brings me more fabulous memories!